BRUSSELS — As if Brexit hadn’t spooked Britain and the European Union enough over the past three years, the two sides agreed early Thursday to extend the deadline to Halloween. “Please, do not waste this time,” European Council President Donald Tusk pleaded. He said the EU was giving Britain six more months “to find the best possible solution” to its Brexit impasse. Like many things related to Brexit, the extension was a messy compromise. May came to an emergency summit in Brussels seeking to postpone Britain’s departure from the EU until June 30. Some European leaders favored a longer extension, while French President Emmanuel Macron was wary of anything but a very short delay. 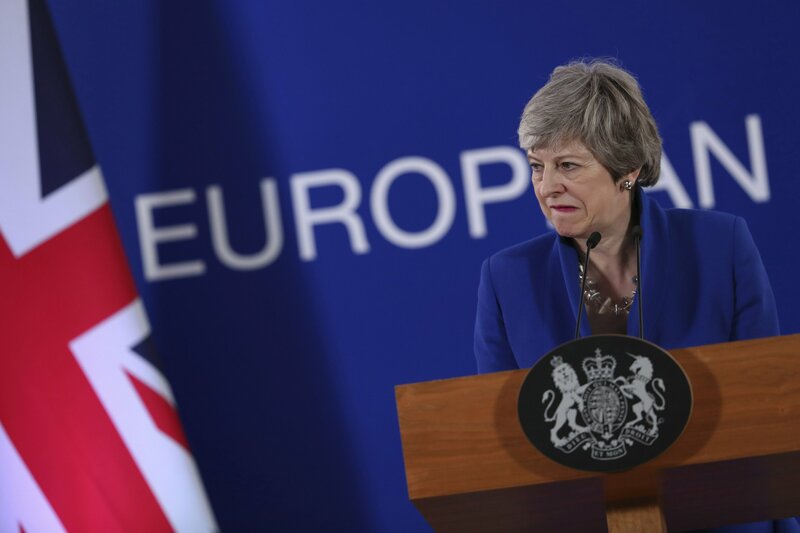 “I continue to believe we need to leave the EU, with a deal, as soon as possible,” she told reporters. May spoke to the 27 EU leaders for just over an hour, before they met for dinner without her to decide Britain’s fate. In contrast to some testy recent summits, there were signs of warmth, even humor. May and German Chancellor Angela Merkel were filmed laughing over a tablet bearing an image showing the two of them speaking to their respective Parliaments on Wednesday while wearing similar blue jackets. “We did the best possible compromise to preserve the unity of the 27 (other EU members) because we have left the United Kingdom more time to deliver a deal,” Macron said. A disorderly Brexit would hurt EU nations, as well as Britain, and all want to avoid it — but there’s little agreement about how. May’s future, meanwhile, is uncertain. She will address the U.K. Parliament later Thursday on the outcome of the summit. “We’re giving them a very long time to take a decision,” he said. “As I learned this evening, Halloween is not a holiday widely celebrated across the European Union,” Varadkar said.